If you've been blessed with a litter of teddy bear hamsters, you'll find they mature quickly. These little guys are ready to strike out on their own when they're only a month old. And after three months, they've reached their maximum length of about six inches. Teddy bear hamsters are actually a long-haired version of Syrian hamsters, the most common breed of pet hamsters. Syrians are considered solitary creatures -- they don't like sharing their space -- so breeding them can be challenging. They should not be bred before four months of age, when they reach sexual maturity, and the female should be in heat when any attempt to breed is made. If she's not, it's likely she will fight with her potential mate (which she may do anyway). Hamsters have a short gestation period and it takes an average of 16 days for baby hamsters to develop for birth in their mother's womb. Hamster babies are known as pups. When they make their entrance in the world their eyes are closed tight and they have no fur. They can smell and are able to move around a little using their front feet. It takes a week for their front teeth to emerge and for their hair to begin to grow. The second week of life sees lots of changes: they are mobile on their own, their eyes begin to open, their ears are erect and they've developed a full coat. At this point they're still nursing, but they can start eating some greens, milky foods and dry hamster mix. It's very important to not touch them during the first two weeks. Mom won't like this and may respond by abandoning or killing the pups. After two weeks, you can try to handle the babies -- if mom will allow it. It's also a good time to do a quick cleaning of the cage, removing the soiled bedding and replacing with some fresh bedding, as well as some of the previous nesting material. Put the babies back in the nest, followed by mom. When they're three weeks old, the babies will start to look like small adult hamsters. They'll still be nursing from their mother at this point, despite eating other food as well. They'll nurse until they're about a month old, which is when it's time to split the litter up. Male teddy bear babies should go in one cage and the females into a second cage. Sometimes it's necessary to separate the babies before four weeks because they're fighting. Although they're still not fully grown, at about five weeks of age teddy bear hamsters are sexually mature. If you haven't separated the litter yet it's likely you may have another litter of teddy bear pups making an appearance. They'll also start getting territorial at this age, which is another reason to make sure they're separate -- you don't want them fighting. At five to seven weeks of age, male teddy bears will have much longer hair than the females of the litter. At this point you may want to start helping the guys groom with a small comb or soft brush. This lets them get used to having help removing tangles in their fur. By the time your teddy bear is three months old he's likely outgrown his exercise wheel. It's important to make sure he has a wheel that's not too small -- a hamster can injure his back by arching too far on a ill-sized wheel. 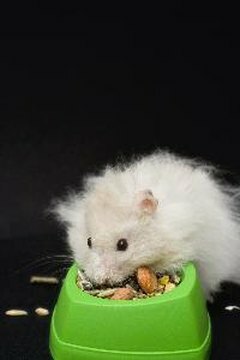 You'll also need to keep an eye on his fur length; male hamsters fur can get caught in exercise wheels, so consider a wheel with covered spindles or using tubes and mazes for exercise.